I love CFA. Love love love it. 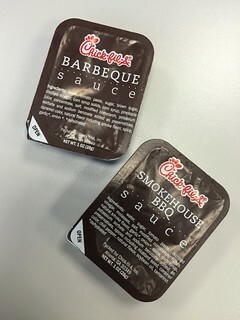 One of the things I love about it is their BBQ sauce. It is tangy and sweet and different than every other ‘cue sauce out there. Very light and unique…..and now they have discontinued it. After it being one of their staple flavors ever since I could remember…they have dumped it for a new “Smokehouse BBQ”. uh…..crap….another key food component of my upbringing is gone away…. Yeah, Yeah, Yeah, cry-baby…so how does the NEW sauce taste??? Actually it’s pretty damn awesome!! It’s an instant favorite and something that would eat on more than just CFA items. This is the kind of ‘cue sauce I would buy in a bottle if available. It has all the classic flavors you would expect from a great sauce. I honestly wish they would have kept both, though. I have a few original bbq sauces left over that I am now rationing….but when it’s over…I guess I can survive and move forward….but I am gonna miss that pineapple-y..sweet ‘cue of yesterday. I thought this whole “political chick-fil-a” thing was resolved. The company owner didn’t support gay lifestyle and supported anti-gay groups. That went public. People protested on both sides of the issue. The company issues statement that they will no longer support anti-gay groups and will embrace all. So why am I seeing all these I Love Chick-fil-a bumper stickers? I mean, I love Chick-fil-a food and I don’t have one of these. Never seen them or even offered one at the drive-thru. Is this simple food-love or is this person trying to tell me he does not support gay rights via his love for a company known for similar thoughts? Or maybe it’s just a sticker and I should shut up? Okay, I guess I have to say this. Out loud. To the millions…… AND MILLIONS of Junk Food Critic fans out there. THE GOLDEN RULE is this: If your damn car window does NOT roll down, then you take your little self INSIDE. Opening the door not only makes everyone in the drive-thru NERVOUS (are you getting ready to rob the joint or are you just an idiot?) and it also is just inconvenient for EVERYONE involved. You have to lean out and back. They have to lean out and over. And it annoys the bloody-blue-hell out of me. I can’t tell you how many times I have seen this, and just about ALWAYS they scrape their door against the bricks or just bang it outright and do more damage to that poor car. JUST. GO. INSIDE. JERK. chickmeal, a photo by Junk Food Critic on Flickr. Chick-fil-a (wow is it annoying to have to type that way each time) has always tried to take an even handed approach to it’s food. It provides great meals and also some healthier choices if you are leaning that way. In the past, I have tried their grilled chicken sandwiches and loved them. True they aren’t as indulgent as their normal fare, but still pretty good. So when I heard they were slightly revamping the kid’s meal, I was interested. Mainly because I love the happy meal idea. More often than not, the portion sizes of food in a kid’s meal is enough for me. The price is usually cheaper. oh–and I get a TOY. I never understood why places didn’t offer toys or something with their adult meals. So I wheeled into the “chick” and ordered the new kids meal. No longer are they serving soda. Which is odd since their lemonade and apple juice contain a ton of sugar I would imagine. Now this was a tidy little SNACK. The nuggets were hot and fresh. Tasty as boneless-skinless-plain-if-you-dont-count-salt-and-pepper can be. It’s essentially an unbreaded chicken strip cut into four pieces. Good for some protein, but I am guessing I will be hungry again in a couple hours. The pouch of puree was rather neat. It’s cinnamon apple sauce basically. So sucking that down might be fun for the kids. Great way to get them more fruits. This was actually the best thing of the meal. I should see if they have these in the stores. Quick and easy on the go food. I take that back. The best part of lunch was the lemonade. Sure the size is way to small for me, but GOOD LORD does Chick-fil-a make some mighty fine LEMONADE. So sweet and tangy. It’s like me, but drinkable! I would totally order this again if I was just a little bit hungry and didn’t want to cook. Who am I kidding??? If I go to chick-fil-a, I gots ta have my SPICY CHICKEN SANDWICH!!!!!! woOOOOOO!!!! 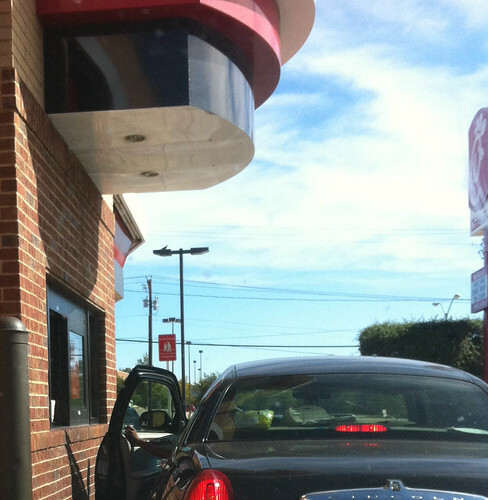 So earlier today, I noticed this dum-dum trying to go through the drive-thru at Chick-fil-a on a Sunday. They are closed on Sunday. Well, as I kept telling that story and sharing that picture (see previous post) I started getting a rather LARGE craving for Chick-fil-a. Asking around, I have found this to be true of alot of people. Chick-fil-a is losing out on alot of business, just from me, because Sunday is usually the day I want it. Probably just because I know I can’t have it. Stupid conditioned response to indirect stimulus!!! So, this frustration leads me to the golden arches, no, not McDowell’s (they have the golden ARCs). I am talking about Mickey D’s. They have this SOUTHWEST CHICKEN SANDWICH that tastes JUST LIKE the regular Chick-fil-a sandwich. AND, I can have it ANY TIME. Several Mickey D’s by me are open 24 hours a day. If you can’t be with the one you love, love the one you’re with!! Driving around town and I cut down this side street. I pass by this Chick-fil-a. There is a woman who is flapping her arms about and screaming at the drive thru speaker. She seems ANGRY. She is honking her horn, and just looks frustrated. I suppose this makes me nosy, but I just HAD to see what the fuss was about. Why are they ignoring her? This behavior is OUTRAGEOUS!!!! She should organize a PROTEST and…..oh……oh…wait….It’s SUNDAY. They are CLOSED on Sundays. After I calmed my self down, (I was laughing. ALOT) I whipped out the trusty camera phone and took this pic. I also sat there for another six minutes while she FINALLY gave up and pulled right up to the window to argue directly. It was then I guess she saw the CLOSED sign, because she immediately sped out of there. Yeah. I pretty much had nothing going on at this time of day. And it was funny.